One Kit. One SKU. One Box. Experience the convenience of cholesterol screening supplies all in one kit. Every box of New Line Medical Screening Kits is enough to test 100 people. Kits also come in a case of 10 boxes which is enough to test 1000 people. 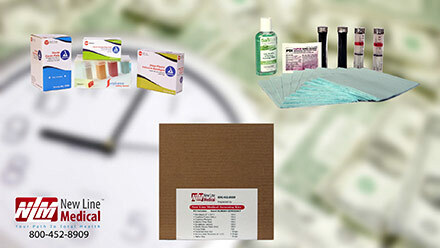 Dynarex alcohol prep pads for aniseptic skin preperation prior to injection or venipuncture. Impegnated with 70% isopropyl alcohol. Asterile ready to use protective dressing for minor cuts and abrasions. Manufactured of strong, sheer, ventilated plastic, coated with a long lasting adhesive. Non-stick pad for comfort and fluid absorption. Packaged in dispenser boxes for convenient handling. Latex-free. STAT STRIP adhesive bandages are easy to open, even when youre wearing gloves. Just pull firmly on the ends to release the outer wrap. You can then apply the bandage directly without touching the pad or the wound. Each bandage is individually wrapped and sterilized. All bandages are 3" long. 100 bandages per package, 12 packages (1200 bandages) per case. 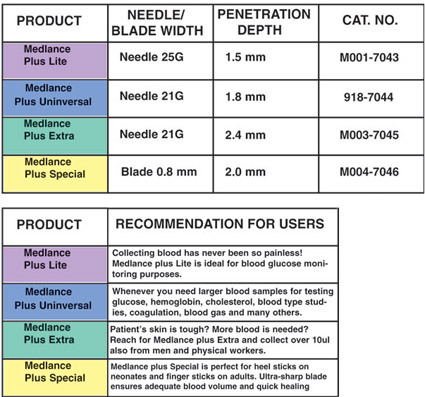 Medlance® plus safety lancets are used to obtain capillary blood samples for various diagnostic purposes including blood glucose, cholesterol, hemoglobin, CRP-tests, blood gas, HIV, electrolytes, blood group tests, fungal infection, multiple tests on neonates. Medlance® plus lancets have been designed as an integral component to the sharps-injury prevention programs in hospitals, clinics, laboratories, doctors' offices and wherever patients and professionals need to feel safe.